Weddings are one of those rare occasions when tears usually translate to happiness. These beautiful shots capture just how emotional the big day is for everyone involved, so grab your tissues! If you aren’t up for a first look, there’s always this sweet alternative. This marine and his bride said an emotional prayer together back-to-back before their festivities began. Handwritten letters are a sweet way to connect without seeing one another before your ceremony begins. This mom can’t believe how stunning her daughter looks. The look of joy on this mother’s face says it all. Your wedding is a big day for your dad, too. He’s not crying, he’s just got something in his eye. This dad lends a helping hand with his son's bowtie. The bride's grandmother was moved to tears by the loving memorial to the bride's late uncle and grandfather. This young girl has a princess moment. A young flower girl admires a beautiful wedding dress. This well-dressed duo is ready for an adventure. A little ringbearer gets some help from a very special attendant. This groom helps his ring bearer prepare for the big event. This bride's furry friend doesn't want to be left behind. A dapper dog gets a little extra loving on the big day. This groom lovingly consoles his bride. This emotional groom doesn't hold back. A bride helps her groom keep it together. There’s so much love on this groom’s face. The power of your partner's gaze can unleash a torrent of emotions. 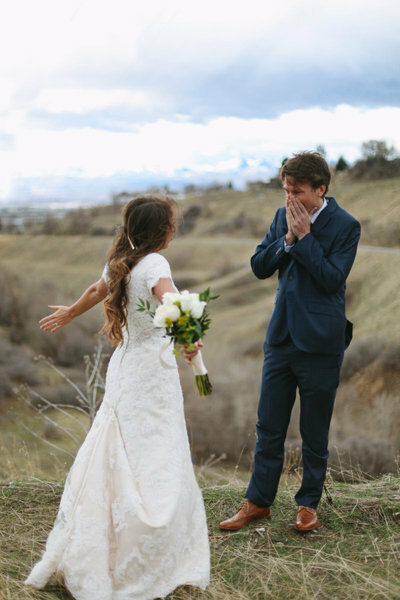 This awestruck groom can’t believe his good fortune. There were no dry eyes during this ceremony. Sometimes, a girl just needs a good cry. Give a little love to your bridesmaids to say thank you for their hard work. These supportive bridesmaids have their friend’s back no matter what. It’s important to set aside some time for your bridesmaids. This special moment is even more touching when you are surrounded by all your loved ones. Steal a moment for just the two of you to celebrate together on your big day. A couple’s first dance is always an emotional experience. This bride and groom had an emotional first dance at their reception. This couple only has eyes for each other during the reception. It’s a moment you’ll never forget. A mother shares a sentimental moment with her son. This baby may not be born yet, but she's making her first appearance in these wedding photos. This little boy played an essential part in this wedding. Don’t forget to put some candid photos with your parents on your shot list for your photographer. This bride and groom make time for a peaceful family stroll. You can honor your family’s history with this touching photo opp. This groom couldn’t wait any longer to sweep his bride off her feet. Take a moment to relax and simply cherish your relationship during the craziness of your wedding day. This couple found a gorgeous spot for a quick cuddle. A special moment, just the two of you amongst a sea of loved ones. The bride and groom share an intimate embrace. There’s always plenty of laughing through the tears at a wedding.